After I live-blogged my Baking/Cooking Day last week, there were hundreds of questions asked about methods of freezing. I’m hoping to address many of these in future posts, but while you’re waiting on that, my friend Amy from The Finer Things in Life offered to write a quick guest post on a creative way she’s discovered to maximize her freezer’s potential and minimize freezer burn. I think those of you who feel like you don’t have space or pans to pull off Cooking Ahead might just re-think that after reading her guest post! Freezing meals ahead of time for busy days sounds like a great idea, in theory. But what about freezer space? What about pans? What about freezer burn? Prepare freezer meals in 8×8, 9×9, or other smaller pans. Anything that will fit in a gallon-sized freezer bag will work. Before filling it with food, line the baking dish with aluminum foil or freezer paper. Fold the foil over the top and freeze the meal. Once frozen enough to hold its shape, pop it out of the baking dish. Seal the meal in a freezer bag, removing as much air as possible. When you are ready to use the frozen, there are two options: you can either remove the wrapping while the item is still frozen and place the food back into the original pan to thaw and bake. Or, you can just slip the whole thing (still wrapped in foil) in a pan and bake it making clean up a snap! * Several meals can be in the freezer while favorite baking dishes remain handy. * Foil and freezer paper can often be found on sale with a coupon. * Wrapping the meal and then sealing it in a bag prevents freezer burn. * This method maximizes freezer space since the baking dishes aren’t stacked up. * And, in light of yesterday’s post, it’s also worth mentioning that your freezer bags can be reused when food labeling is done on the foil or freezer paper. Amy is a Tiny Town coach’s wife and mother of three convinced that the The Finer Things in Life offer more joy than anything money can buy. The new Ziploc vaccuum bags are AWESOME!! They work really well and prevent freezer burn. Plus with coupons can be inexpensive! Thank you for a wonderful guest post. My biggest hesitation in cooking in bulk and freezing has been the issue of multiple pans or the expense of buying the throw away aluminum pans. ($1 here and they could really add up)The method you mentioned is really a wonderful idea and takes up much less room in the freezer! Thanks so much! I’m ready to get to baking now! Brilliant….absolutely Brilliant! You know, I have struggled with this off and on…trying to figure out how to store my made-ahead meals like lasagne. and even had a friend ask if she could store it in her pyrex dish….I was thinking…well, I don’t have enough pyrex. So I started using those Glad baking pans…they are expensive, even when you reuse and reuse….This is brilliant. I am so glad I found your site! Thanks for the great tip on freezing food and saving space and pans. I’d like to give it a try. Question for you: when you take a freezer meal out of the oven, should you thaw it first before you bake it for best results? This is AWESOME! I can’t wait to get some meals in our small freezer!! THANK YOU! I just sent a comment with a type-o. I meant “should you thaw the freezer meal when you take the meal out of the FREEZER (not out of the OVEN). Sorry for the confusion. Thanks for the info. Now I feel better about not getting freezer burn and using up many pans. Great idea. Just don’t use aluminum foil to wrap dishes with tomato-based products in them (ie, lasagna). The acid in the tomato will eat through the foil and you’ll have aluminum bits stuck in the food. Great post! I never even thought of doing it this way, but am DEFINETELY going to. It seems so obvious, I can’t believe it never clicked in my brain to use freezer paper or aluminum foil first! I’ve always gotten freezer burn and think this would be the perfect, cheapest way to prevent it. In my experience, I would also add labeling your bag with the contents and date, for example: “Lasagna 10/09” so you can eat the oldest first, and there’s no ‘mystery meat’ floating around that doesn’t get eaten because no one knows what is in there! Thank you sooo much! This post is so timely. My sister and I are planning our baking day, each at our own home. I was really wondering what I would do about pans. I didn’t want to spend all the money on them. This really helps! Great idea about freezing it in the pan and then just removing the foil! I had heard some where that it wasn’t good to have the aluminum foil next to the food. Has anyone else heard that? Hoping it is an old wives’ tale as I love this idea! Nifty idea! Thanks for sharing– I’ve never thought of doing this before. I’m a working wife (no kids yet) and know that having freezer meals would be a huge help after those long days at the office. After being inspired by your baking day, I have made a list of meals I want to make a freeze. I was sharing this with my mom and she gave me this idea as well. Thanks for the more detailed instructions on how to pull this off. I was dreading the thought of my favorite pans being out of commission for a few weeks. This is ABSOlUTELY awesome. I am a freak when it comes to freezer burn. I always wonder if I sealed something improperly. I worry if something is still safe to eat. But this will definitely alleviate many of these questions, and I can feel more confident about my preparation. and I hate leftover burnout. I feel soooo wasteful. Thanks! This is brilliant! Thanks for sharing. I cannot believe I never thought of this. I only have two baking pans so I don’t make freezer meals. This is so logical and easy… I will DEFINITELY be doing this! Thanks!! I LOVE this idea! I am so thankful that Amy shared it. You can make your own “pan” for freezing non-runny meals out of a cereal box. Just lay it flat (with the back side down – where the mind games or advertisements usually are) and cut out the front of the box. Reinforce the sides with tape. Lay in a few layers of overlapping freezer paper and ladle in your casserole, lasagna, whatever. Place another piece of freezer paper over the top. Let it freeze – even overnight will not cause freezer burn. Pop it out of the cereal box form – you may remove freezer paper – and then store in a ziplog bag for long-term freezer storage. This has worked for me for a number of casseroles – even ones with soups in them, as long as they are not overly runny. For Cherie: I try to thaw frozen meals before baking (I just set them out on my counter for a few hours, not what you’re told to do but it works!) but if it’s a real meal emergency you can toss a frozen casserole straight into the oven. It will have to bake longer, of course. I too love the idea! I do a food exchange every month and foil pans can add up… but I too would like to ask… does the aluminum not come off on the food? I know that a couple times when I’ve had to cover a leftover pan of stuff (in refrig) with foil that pieces of the foil will come off on the food. but it might have always been tomato based items as mentioned in a previous post. One way to prevent would be to remove like you mentioned but I like the idea of not and then reusing bags… anyway any further comments on this would be appreciated. I just read someone else’s post and it reminded me of something. In our group, when we make our meals to go in the freezer, we put labels on that include the name and date, but also cooking instructions (such as, thaw in refrigerator overnight, 350 degrees for 45 min.). This is especially helpful when I use these for friends that have had babies, surgery, etc. Do you cook the meals before freezing, then re-heat? or do you freeze them “raw”? Jen-There is some debate out there as to the safety of aluminum…linking it to Alzheimers. Go with freezer paper instead! Wendy-Loved your cereal box idea! What a GENIUS idea! Too bad I never make food ahead of time, though. Great idea! I think that my childhood as the oldest of 7 kids leads me to always buy bigger pans than I need, even for my family of 3. Excellent thinking. I think that a bunch of smaller pans will allow for freezing, but it will also be insurance against wasted excess leftovers. Thank you! What a great idea! I’ve had these same problems and now a solution, yeah! Great ideas. Any tomato based product will eat threw aluminum foil, so I use freezer paper for those things. I also Put chili and soups in freezer bags then put them in my crockpot in the freezer overnight. When I need to warm them up they fit into the crockpot nicely. I can’t wait to try this method! Thanks for posting – what a great idea Amy! For Angela: I almost always remove the foil before baking, while it’s still frozen. If you have trouble with the foil sticking, you could always give it a shot of cooking spray before filling the pan with food. Or… just use freezer paper. Air trapped in your container is the reason most things end up with freezer burn. We have lots of success with big ziploc bags. Slide the zipper almost to the end, insert a straw, and such out all remaining air. It is really cool for the kids to watch (mine always laugh), and we have never had freezer burn again! Great ideas in your post! For those looking for good main dish freezer meals or other tips on freezing food for future use- Visit your local county extension office. There is most likely a home economist on staff to answer these types of questions or give suggestions. I know, this is my job. Thank you for this. I was wondering if you invested in disposable pans or just had a lot more bakeware than me. Now I know! Great post – really excellent. This is something that I have been wondering about and will be able to put this information to good use. Thanks again! Love this idea. I have tried Freezer meals before, but missed having my pans handy when I needed them! I do similar things with freezing but instead of using ziploc bags for storing, I seal my food in Foodsaver bags. 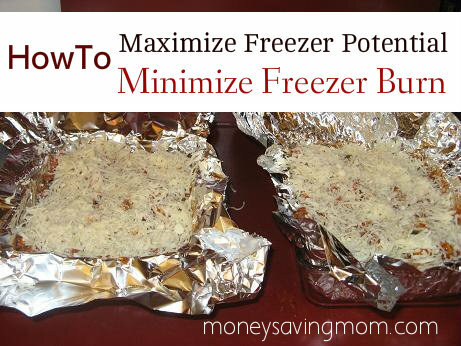 I have found that this works really well to prevent freezer burn and keeps the food fresher longer. It also works really well for when it’s time to thaw the food, you can safely put it under running water without any fear of water ruining the food. I will say, it is very unsafe to thaw your food on the counter. Most cases of food poisonig happen at home, not resturants. i’d also like to know if it’s better to fully cook a meal and then throw it in the freezer, or just assemble it and freeze it with the intention of cooking at a later date. thanks! Rhonda – Thank you for that genious idea (put the food in a bag & in the removable crock pot pot to freeze it in the correct shape). I have chizzeled at many a frozen meal to fit it into the crock pot before work. I can certainly spare the crock pot pot overnight while it ‘takes shape’. Duh! I imagine you could probably stack a couple ‘ziploc meals’ on top of each other in there too! Blaire ~ I assemble and freeze without cooking. Then thaw and bake. I buy ham when on sale. I cook in the crock pot (if not already cooked). Then I cool,wrap in foil , then into the Ziploc freezer bag. I can get 4 meals with ham out of one ham. Such as bean soup, Omlets…I drop the section from the freezer, into the crockpot on warm and it will be thawed ready for use in no time. This method of cooking ahead was a life saver when I just had my 4th baby by c-sec. I made a few 9×13 casseroles and lasagna. It was so easy. I just lined my dish with foil. Sprayed with cooking spray to prevent sticking. Made everything like normal and instead of popping in the oven – I stuck it in the freezer. I wrote out a quick note of what it was, when I made it, and simple directions to cook. Once it was frozen, I popped it out of the dish and was able to use my dish for everyday use. The frozen meals stack up nicely together. And then when I was ready to bake it, put it back in the 9×13 dish and baked. It was awesome! My husband just returned from Walmart with Freezer Paper–thanks for the tips!! Our first baking day! This is brilliant!!! I would never have thought of it – and often find myself “out” of casserole pans because they are all in the freezer. Thanks for sharing! Thank you so much! I have been cooking extra every meal so I’d have leftovers to freeze, but they’re still sitting in my fridge because I was trying to figure out what pans I could do without! I’ll definitely be using your ideas from now on! OH this is just GENIUS. I’m (literally) in the middle of making 2 chicken pot pies to freeze for post-baby meals and reading this post came just in time. THANK YOU!!! You are too smart–seriously! I love this idea. What has happened in my kitchen is I freeze my dish in the actual square or small rectangle pan, and then I no longer have those pans to use because they are in the freezer. I only have one of each and I need to be able to use them. Problem solved with your method.